Epsom salt helps to treat constipation very effectively. It is not actually a salt, but a naturally occurring pure mineral compound of magnesium and sulfate. Constipation is defined as irregular bowel movements of less than three times in a week and caused by slow movement of stools through colon. 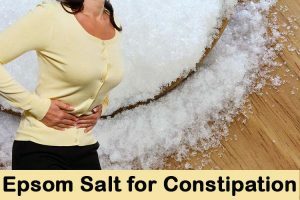 How Epsom Salt Helps To Treat Constipation? Epsom salt contains an ingredient called magnesium sulfate which acts as laxative that works by drawing water into the bowels to soften stools. Magnesium present in the salt will promote contraction of the bowel muscles and thus the stool is excreted easily. Epsom salt acts as detoxifying agent for colon cleaning. Mix a teaspoon of Epsom salt with 4 oz of water. Add a teaspoon of lemon juice to improve the taste. Drink the mixture in one sitting. If you didn’t get effective results then repeat the process after 4 – 6 hours. Read the dosage instructions from the box of the salts. For adults, take 2 teaspoons of salt dissolved in a cup of water or fruit juice. For children of above 1 year age, take 1/2 teaspoon in cup of cold water or juice. Some natural health experts suggest that deficiency of magnesium is a likely cause for chronic constipation. However, there is an answer for this, taking Epsom salt baths regularly won’t cause any side effects and will help to give relief from constipation. Pour 1 – 2 cups of Epsom salt in a warm water filled bathtub. Stir well and soak in it for 10 – 30 minutes. After bathing, rinse your body thoroughly. Pat the skin dry and repeat this process regularly. It cleanses the colon and relieves constipation. Mix 2 cups of Epsom salt in a warm water filled bath tub. Add 1/2 cup of ginger powder and baking soda and stir well. Soak yourself in this water for 30 minutes to allow the magnesium to soak into the body and removes toxins from the intestines. First start with once a week and then take this bath 3 times a week till you reduce constipation. A healthy child should have 2 – 4 stools per day, if it is fewer than this, they may have constipation. This is where you can use Epsom salt bath. Do not use on children less that 6 years of age. Pour 1/2 cup of Epsom salt in bathtub with lukewarm water. Soak your child in this water for 10 – 15 minutes. When out of the bath, apply some extra virgin olive oil, hemp or castor oil onto the child’s abdominal area. Massage it gently in a clock – wise motion, 2 – 4 inches from the belly bottom. This will elevate the natural bowel movement of the intestine. Can Pregnant Women Take Epsom Salt for Constipation? Magnesium sulfate or Epsom salt generally comes under category D drugs for pregnant women, meaning it could harm the unborn baby. Always tell your doctor, if you’re pregnant or planning to become pregnant before using this mineral salt. It can cause low levels of calcium and bone problems in an unborn baby, if this salt taken for 5 – 7 days during pregnancy. However Epsom salt baths is not harmful, but make sure that the water is just warm, not hot. It also give you relief from pregnancy aches and pains, as well as constipation. If you feel like you are sweating in the tub, make sure to get out and cool down. The American Academy of Pediatrics has supported the usage of this salt by breastfeeding women, but with some precautions, so be sure to talk to your healthcare provider. You can find this Epsom salt in any major drugstore, it will not be hard to find. You can also buy it on online stores like Amazon, eBay, Wal-Mart, Vitamin Shoppe, etc. Although it may not be a well known brand, it won’t be more than $5 – 6. Always follow the doctor’s instructions or the directions given on the package. Avoid taking this Epsom salt while you’re taking certain medications like antibiotics, corticosteroids, diuretics, antacids or antidepressants, pain relievers, blood pressure medications, vitamin and mineral supplements etc. Also avoid taking other medicines within 2 hours before or after using this magnesium sulfate as a laxative. If you have used another laxative in the last two weeks with no success, ask your doctor before taking this treatment. It increases thirst, so drink a lot of water to replace it in the body. The continuous usage of this Epsom salt makes you dependent on it for bowel movement and could damage the intestinal lining. So do not use frequently. Do not drink more than 2 glasses of Epsom salt water in a day, as it might cause diarrhea, abdominal pain, nausea, bloating, etc. People suffering from chronic constipation, kidney problems, digestive problems and other intestinal problems should avoid using Epsom salt. Immediately seek medical attention if you have taken an overdose of this salt. Symptoms include fainting, nausea, slow heart rate, feeling very hot and others. Epsom salt can also be used for enema. But make sure to use warm water rather than cold water by adding 2 – 4 teaspoons of Epsom salt in 1 glass of water. Use in a rubber syringe and follow the guidelines on the surface of enema syringe. You need to also have a balanced diet, do regular exercises etc, have fruits like prunes regularly to completely get relief from the constipation. If you have any other remedies or any questions related to this topic then feel free to share with us. A few kg lighter and after a hot bath feeling like a normal person. Hi, I’m confused between epsom salt brands of external and internal usage. Can you tell me the names of the brands which can be used for drinking? As per WebMD, there is no risk of consuming epsom salt. Yet, it is better to consult your doctor. Is soaking Epson salt the same salt for eating? Or is their a different Epson salt? I was using epsom salt to relax, it does help to loosen your stool so be careful not to use too much epsom salt. Not planning to consume it with warm water soaking my feet or epsom bath is enough for both benefits of relaxation and constipation relief. Note to Hilda Magallanes. Epson salt it NOT the same as table salt! Table salt is sodium chloride, NaCl. While Epson salt is magnesium sulfate.. Yes, you can but it is better to start with a small dosage. Can I take epson salt for a laxative after I took a small cup of milk of mag? Yes, you can. But make sure there is at least 2 – 3 hours of gap between them. How often can you drink the epsom salt?